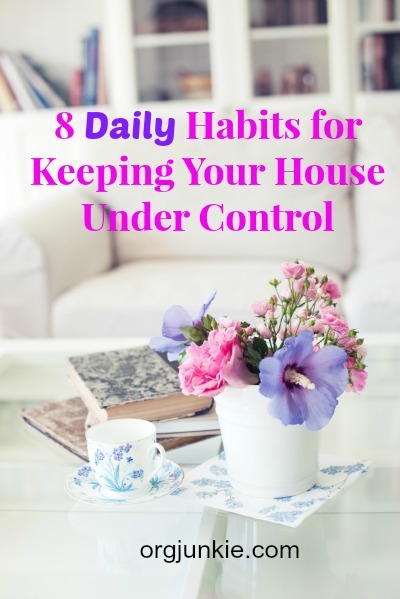 These 8 daily habits, centered around the idea of keeping it simple and not sweating the small stuff, make it possible for me to have my house ready for company in 15 minutes flat and you can too. First and foremost is keeping the clutter under control. Piles of stuff scattered here, there and everywhere can be suffocating and chaotic. If you don’t have time to de-clutter your home all at once, start with the areas that guests congregate first. Remember the golden rule: if you don’t love it or use it, get rid of it. I love the fact that less stuff and knickknacks means less dusting for me! This is one of my top tricks to staying organized, never leaving a room empty handed. I’ve gotten into the habit of always taking a look around before leaving a space in anticipation of putting it away in the space that I’m going. Is there a toy that needs to be returned to a bedroom, a coffee cup to the kitchen? If you happen to be going there, take it with you. It saves time in the long run because you aren’t leaving it all to clean up at one time. You’re on top of it. You get the idea. Set a timer for 15 or 20 minutes….you’ll be amazed at how much you can get done in a short amount of time. Also my Organizing Junkie App (no longer available, sorry) is set up to help you with these things…it includes an extensive list of 5 and 30 minute tasks as well as a timer you can set to help you get going. Remember every little bit helps so don’t let negative Nancy interfere by telling you it’s no use. Every little bit counts and over time all those little bits add up to make one big bite. My kids are ages 14, 12 and 6. They have regular daily and weekly chores that include cleaning toilets, sweeping floors and tidying the kitchen. It’s amazing what a load is taken off when everyone shares in the housekeeping requirements. You can read more about that here. This one became a rule in our home originally because of my middle son’s food allergies. However it quickly became a hard and fast rule when I realized how much less mess it meant I had to clean up everywhere else. Nothing tricks the senses more than walking into a pleasant smelling space. Try burning some delicious candle scents or adding some Christmas-y oil fragrance to a diffuser. Two of my favorites are gingerbread and pumpkin pie. Makes a big difference! The last time you visited someone else’s home did you spend the entire time thinking about their dust bunnies? Nope, chances are you didn’t and neither are the guests in your home. So cut yourself some slack and for goodness sake stop apologizing for it. That only draws attention to whatever it is you don’t want your guests to focus on and makes them feel uncomfortable in the process. Above all, remember it’s all about keeping it simple and not sweating the small stuff. Please feel free to share your organizing journey and encourage one another in the comments. You are also invited to link up to the linky below with any posts related to your 52 weeks of organizing participation or to any post of an organizing nature that you feel will inspire and encourage others in their quest to get organized. Please remember to link back to here though so we can reach out to as many people as possible in need of some inspiration. I love this whole post! We’ve just gotten rid of 5 boxes of stuff, 2 bags of clutter, and a shelf that just didn’t work in our space. I feel like I have so much extra space just knowing that I’ve relieved myself of things we don’t need or use. And I’m always amazed at what I can get done with the kids help for 30 minutes, and they are still little. I’ve really been trying to practice “never leave the room empty handed”. If I’m heading in the right direction, why not take something and put it away! I have to say you’re blog has changed my life. I was (err… am- I’m still working on it) a messy person. But I love your easy rules like never leave a room empty handed and just take 10 minutes a night to tidy up. My question is how do I get my husband on board?! Our house was a mess and I did a total revamp. Then for a while I was able to follow your rules (I even purged my closet!) but I wasnt getting any help and I wasnt even asking him to clean- just not make a mess! Any advice?? I cannot scrub two toilets in 15 minutes. I have 2 sons and the world’s hairiest husband. It takes me 15 minutes just to gas up the sandblaster required for the caked-on boy urine fired into all the toilet seat nooks and crannies. Good times. Happy holidays and thank you so much for a brilliant year of organizing!!! It has been fantastic year and I have learnt so much!!! I LOVE these rules – and may print them out to add to my bulletin board above my desk! I linked up to my blog as we need help – we have our Magnetic Wall Commander Center.. but not much on it to make it functional yet. 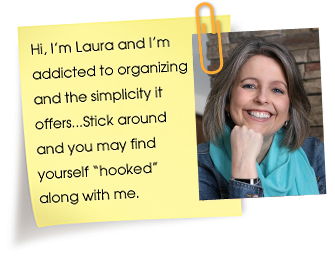 Laura, feel like going crazy with ideas? Teehee. Ok. Pretty please with sugar on top? Anyone? Bueller? Estou sempre em busca de algo para melhorar a minha rotina domestica! Bjos! Hello! You have a wonderful blog! These 8 steps are great and I already do just about all of them, which makes me proud of myself that I’m doing it right! For #5 I have a pack of lysol wipes under the counter in each bathroom as well as a canister of (store brand windex) mirror wipes to do a quick wiping of the mirrors and faucets. I usually take one and wipe down one bathrooms mirrors and faucets and march right into the other one to use it again. I know I am going to love looking around your blog! Thank You!! I need to get my husband to abide by the rule to stop apologizing! He does it about EVERYTHING that is unfinished and it drives me crazy 🙂 A house has to be really gross for me to notice when I go for a visit. I’m not there to see their home but to see them! Hey, I love your third tip about what you can do in 15 minutes!! And it’s funny how I just noticed that if you put in an extra 5 minutes, (in total, 20 minutes) you can probably do all of the above!!!! So exciting!! We keep a bottle of all purpose lysol under the sink. The kids are taught to spray the entire toilet for as long as it says to kill germs. Then use three wraps around there hand (removing it of course ) to wipe down the toilet. Of course I dont care if they use half a roll but they dont and they are pickier than I am. If I say I think I am going to be sick my daughter runs in there to check the rim and lift the lid for me. They are suppose to do this once a week bu I have seen it more and sometimes less. I clean it myself lady visits. I used to live in a big old house and it was a lot of work to keep it clean, so we decided there would be NO eating outside of the kitchen and dining room. We weren’t watching a lot of TV at that time, so it wasn’t really a hardship, but I sure wouldn’t want to live that way now! We have that rule as well Janet most of the time. For a special treat we eat on TV trays in the basement to watch a movie, but it’s usually stuff that isn’t messy to eat. I do the same thing in my bathroom Laura with the wipes, takes a few seconds to freshen the toilets in between the weekly clean.